Here is another project from this month's Stampers Club, also using the "Christmas Cocoa" designer paper like yesterday's card did... a side-step card with fun mountain and valley folds in it! You can also make it a fabulous holiday photo card, as seen in this original swap card from Georgia Giguere, which I was lucky enough to receive at Founder's Circle this year. The whole thing uses a standard half-sheet of cardstock... it's just all in how you cut and score it, right? 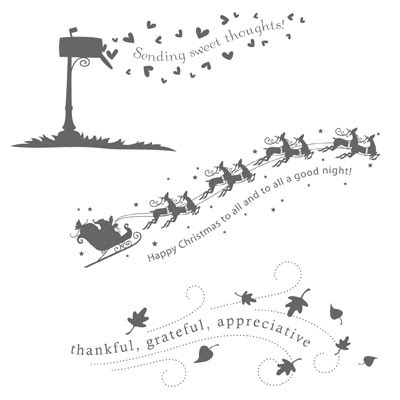 Our third card features "Wandering Words" from the Holiday mini catalogue. I love how this set can be used for Christmas, Valentine's and Fall/Thank You Cards!